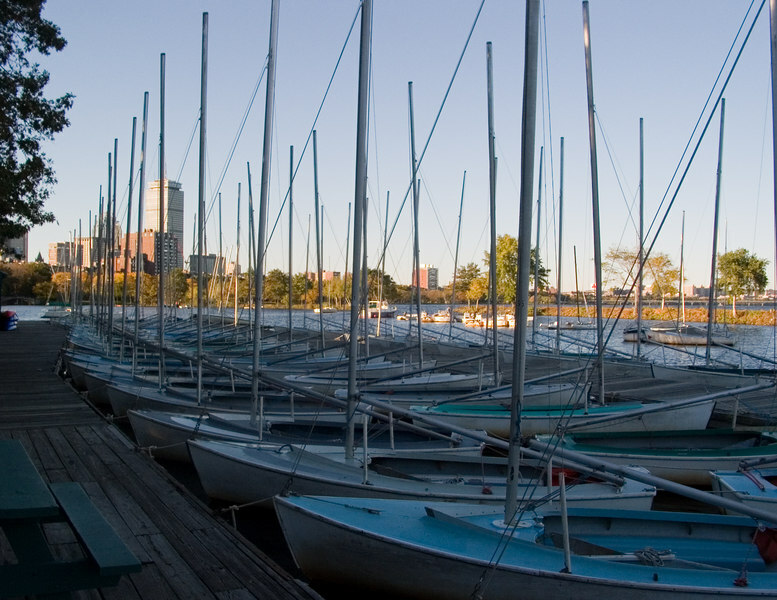 On Oct. 15, I joined CBI (Community Boating) on one of their monthly sailing trips into Boston Harbor. Depending on conditions, they choose one of the harbor islands as a destination. This time, it was Georges Island, home to Civil War-era Fort Warren. We left early in the morning, preparing the fleet of six Rhodes 19 sailboats. These get towed out to the inner harbor, after lowering their masts, which are hinged. The sail out was easy, with an off-shore wind behind us. On the final leg, we put up the spinnaker! I'm glad I had packed an extra layer, since it was cold out on the water, especially early on. We picknicked on Georges Island, and had about an hour-and-half for lunch, exploring the fort, etc. Then the sail home, which was up-wind, involving long tacks across the the channel. We got back in the evening, after a full day sailing. Apart from our skipper, I was actually the most experienced sailer on our boat (not saying much! ), so I actually did much of the sailing out and back, which was a lot of fun, though it did cut into picture-taking opportunities. Early morning on the river, boats waiting.